When organizing a sailboat journey around the Virgin Islands, yacht charters are among the most popular options chosen both by people who are interested in thrilling adventures and those who are just interested in having a quiet and relaxing time. Apart from the most well-known choices people tend to make when booking a sailing yacht charter, however, there are many others that may be of interest depending on your background and the goals you may want to reach on your vacations. When it comes to the Virgin Islands, yacht charters can provide many opportunities for bareboat enthusiasts who are not yet skilled enough to take on the sea by themselves. Flotilla holidays are a perfect example of this, providing you with the possibility to charter a boat on your own with minimal skills. This is mainly due to the fact that a flotilla holiday entails a group of boats sailing together in a somewhat loose formation. As a result, not only will you know exactly which way to go and keep in touch with professionals who already know everything about how to handle a sailboat, but people will be standing by to provide you with assistance should you have any real need for it. A common choice among those looking to book Virgin Islands yacht charters these days is to search for companies capable of providing them with larger sailing yachts with many acceptably large cabins and comprehensive facilities. 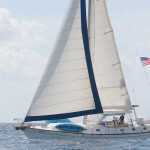 Such services are usually considered ideal by people in search of cabin or berth charters who are not very specific about itinerary and location details or those on corporate retreats who want regular, crewed yacht charters for a short and quiet vacation visiting some of the main locations of the Virgin Islands. With a deck that measures more than 45 feet in length, a sturdy, luxurious design, facilities fit for any potential need and enough on-board space to accommodate a larger family or group of people, the yacht provided by Sopris Charters is among the top boats that people looking for a fun, entertaining or quiet retreat in the US Virgin Islands tend to select. In the Virgin Islands, yacht charters that offer full support and help for clients are sometimes hard to come by; however, we can provide you with a crew, captain and all necessary services even for a longer trip, and we will also provide you with advice and support every step of the way while you’re exploring the majestic beauty and unique locations of the Virgin Islands.